Multitrack Tape Recorders: Which ones are OK? This is 2019. 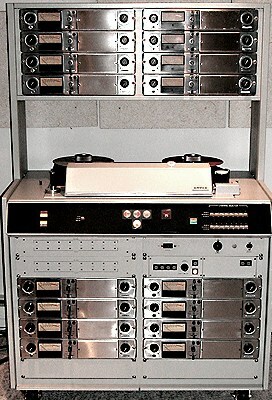 Many multitrack recorders have become available that were based on electronic and mechanical designs done in the late ’60s or early ’70s. That’s 50 years ago … I include Ampex MM1000, 1100, and 1200, MCI machines of all types, most Studer, Scully, and numerous other brands. The mechanical designs of these machines are borderline at best. It’s simple: 2 inch tape is heavy. Moving 2 inch tape precisely and consistently from one end of a reel to the other is not easy to accomplish. Electronically, they all suffer from noisy and/or slow punch ins/punch outs. And maintenance: these machines are a bear to keep working, even for a short time. Parts are difficult to find. Techs who actually know the machines are harder to find. The remote control and autolocator functions of these machines are inadequate, inaccurate, and often nonexistent. Scully 100, MCI JH5, JH10, or JH16, ACES, Saturn, Ampex 1100, ATR124 (unless you are a bored computer/electronics and mechanical genius), Studer A80 MK1,2 and Otari MTR90 MK1. I’m sure I can add to the list. These machines require constant attention and alignment. And let’s be clear: if they are not properly mechanically aligned some of these machines can Eat Your Tape! If you are a technodude who needs a hobby, this could be your life … BUT, if you actually want to record music, do sessions with other people and maybe even attract clients to pay for studio time, there are ONLY three machines you can buy…PERIOD! 1st picks: Studer A827 or A820 … They are the best machines ever made, for a plethora of reasons, the most important being that they are very stable and reliable. The functions are awesome, and of course, they sound great! They lock up to anything, and their remote control is very talented. These days they are usually available for under $10,000. The MK2 is inexpensive to buy, reliable, gentle on tape, does flawless punches; just great remote and locator. Usually found for under $5,000. These 3 machines can be repaired, work day to day with minimal attention, and look good. I know … “my favorite recordings were done on a (fill in the blank).” So? This is 2019. Do you want to record, or wax poetic about your tape recorder having done Elvis? That’s it, that’s my rap; take it or leave it, but Don’t Say I Didn’t Warn You! Thanks Dan! Does this mean I’m famous at last? You’re famous at my house!